Aircraft mechanics supervisors have real-time access to a consolidated view of information and analytics-driven recommendations. 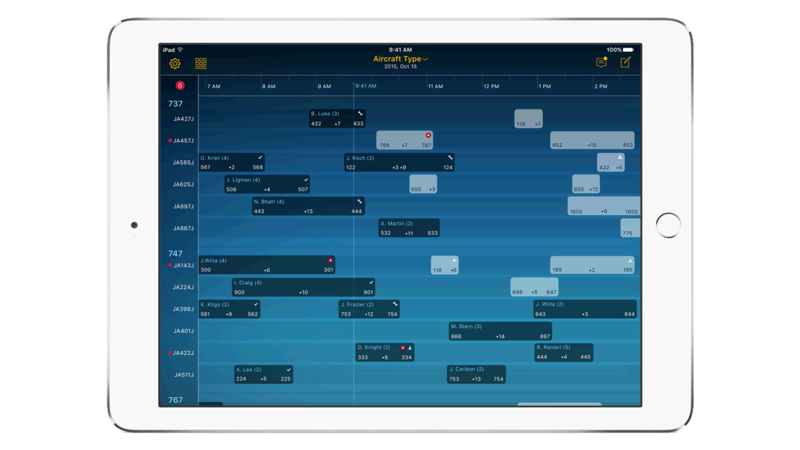 It lets them optimize resource assignments, improve communication and resolve work orders to achieve on-time arrival and departure goals. Internal documentation procedures can be more consistently performed – faster and with greater accuracy – with photos, videos and voice capture. Supervisors of aircraft mechanics who are responsible for assigning mechanics typically work with large volumes of paper-based information and mechanic information which is not always timely or accurate. Assign Tech brings together all the data and instantly recommends the most qualified engineer for each job. Analytics can be used to build optimal staffing models (number of people, type of skills), and predict recovery times and recommend next best actions for work underway. The built-in camera on the iPad enables individuals to use photos and video report problems with greater efficiency. It helps to gather more evidence to upgrade traceability of mechanics. Using FaceTime and iMessage, supervisors can connect teams with experienced mechanics and servitors to trouble shoot and resolve work orders at moment of service. Notifications allow the supervisor to minimize delays and improve the efficiency of their engineers.